That looks and sounds very tasty and healthy. Enjoy your day! MMmmmmmmm... that looks really good. It kind of reminds me of the Italian recipe pasta faggoli or however they spell it. My guys would love the shrimp. Even JDaniel inhales them. This looks so delicious!!! I want some right now! YUM! That sounds good! My most recent favorite recipe from a magazine was cranberry orange salad from Prevention. Lisa! wow! I missed your post yesterday so I am glad you made mention of it, with your grandmother's necklace. You look adorable. That dress is great on you, too. Today's recipe: sorry, me no likey shrimp...but don't tell your boys. My middle granddaughter LOVE LOVE LOVES seafood! She won't pop-tarts or granola bars but wants shrimp cocktail for breakfast. silly kids. Looks yummy, thanks for sharing the recipe! That looks delicious. So does the bread. You come up with some great combinations! I will have to try this recipe. My hubby and son like shrimp. I Have not found any good recipes in magazines recently. I did find a great paleo cookie recipe on pinterest last week. 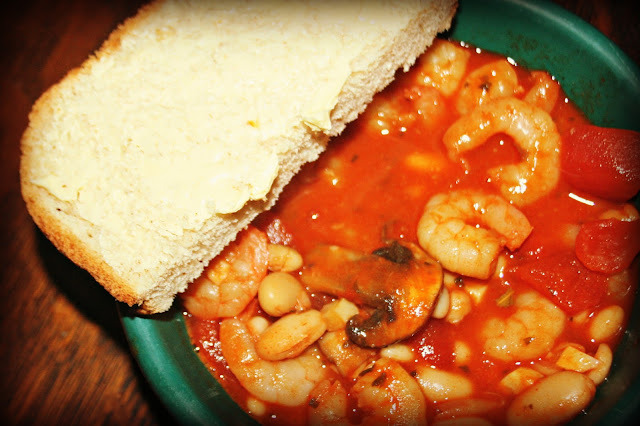 Mmmm...love beans, but am not a big fan of shrimp. When I was pregnant with my daughter 27 years ago, I developed a huge (I did say huge, didn't I) aversion to shell fish, crab, lobster, shrimp. I can now tolerate a bite or two on the odd occasion, but sometimes the smell still sends me running... isn't that odd?? You've made me think though, it's been a very long time since I made a pot of Navy bean soup... I'm heading for the cupboard. Did you get my email this morning? I try a few from the paper.This sounds good,I just got 3 pkg of shrimp at Wally yesterday. We love seafood! I even splurged at Christmas and got Stuart a gift certificate for Maine lobsters since we can't get fresh seafood here. I'd definitely try this recipe-we've used frozen shrimp in the past and I think your recipe looks really good! Looks delicious, Lisa. I'm sure that your boys enjoyed that meal.... YUM..
Darn. I wish I liked shrimp! Okay, now that's a recipe I would love without too much spice! Looks good! It looks really good to me! My boys are that way with spicy things. Even toothpaste was spicy to them. LOL They were so used to the ultra mild organic stuff. When they learned to spit we used regular toothpaste. It was all the sudden spicy. We love shrimp! And I buy bags of it at Walmart. My son has loved shrimp since he was a youngster. :) Your soup look so good!